Today we are going Greek, because who doesn't like a little Greek food in their lives!? This past weekend my husband had a hankering for Salmon, so rather than oil it up (okay, I still used a little oil) and add a ton of unnecessary ingredients, I decided to keep it simple and make it Greek! 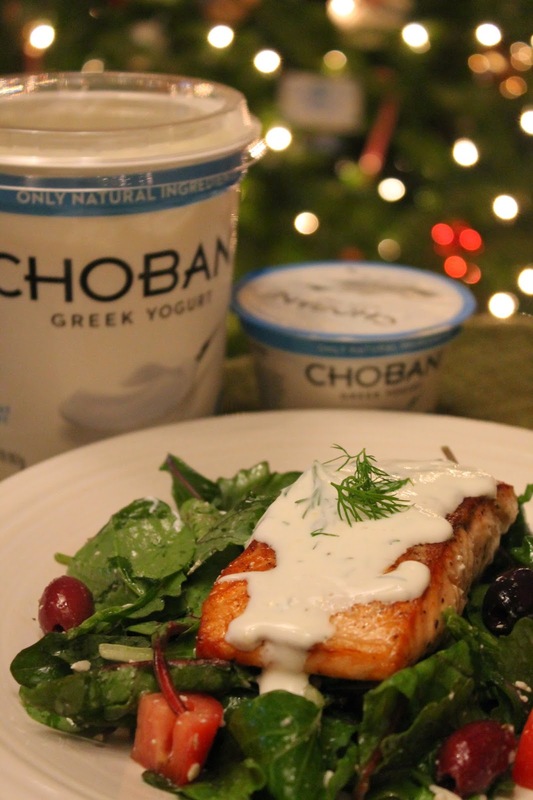 The timing worked out perfectly because I was inspired by Chobani’s #MadeWithChobani project, where bloggers can make a recipe using Chobani Greek yogurt (which is our yogurt of choice and quite fabulous if you ask me). Now, there are a number of ways that I eat my yogurt - plain, with fruit and granola, on pretzels, as a dipping sauce, in smoothies (mmm smoothies...), and more! 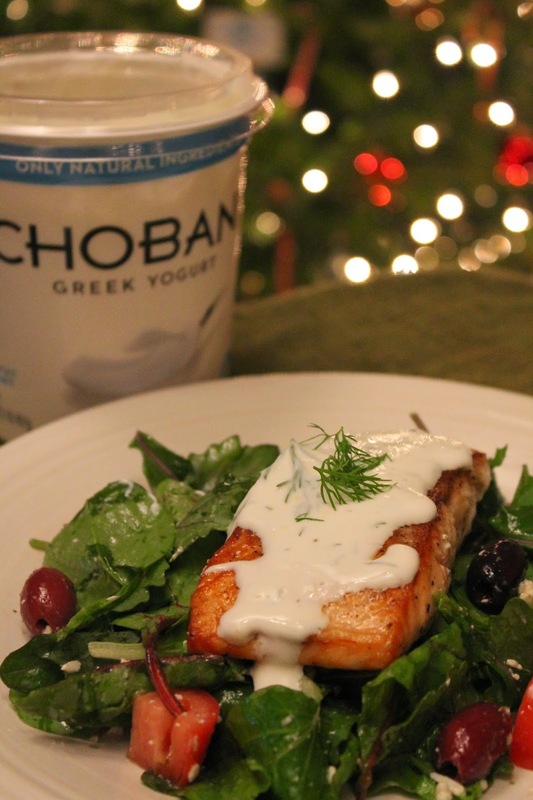 However, since I like to eat my fish with a yummy (and albeit unhealthy) sauce, and since I like to load my salad up with dressing, I decided to use Chobani instead. That way I would still have a delicious sauce and dressing without all of the extra not-so-good-for-you-stuff! So go ahead, give this a try, and you will all become Chobaniholics! Drizzle a tablespoon of oil in a medium sized pan and heat. While your pan is heating, pat dry your salmon with a paper towel and sprinkle just a little salt and pepper on both sides of the salmon. Place the salmon into your heated pan and cook for about four minutes, flip, and then cook for roughly another four minutes. Remove salmon from the pan and let sit for a couple of minutes. 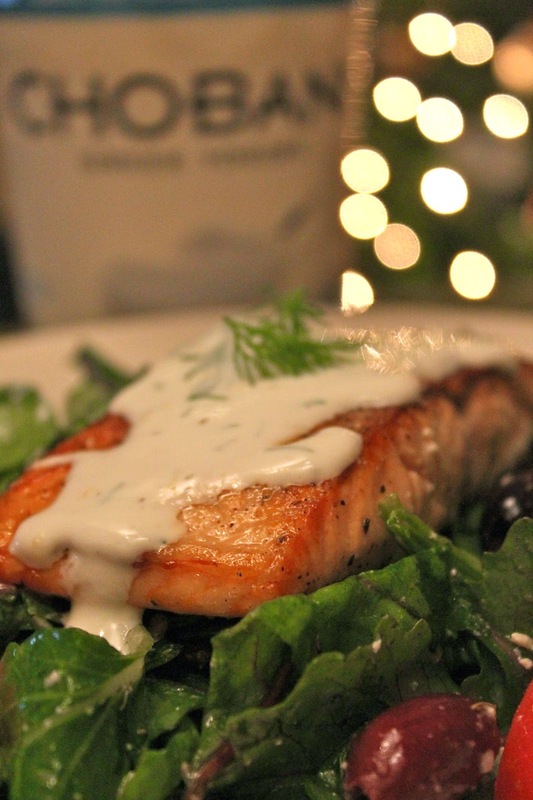 While your salmon rests, prepare the salad and sauce. In a bowl, toss the lettuce, olives, tomatoes, cucumber, and feta cheese. Set aside. In a separate bowl, mix together the yogurt, lemon juice and zest, dill, and a little salt and pepper to taste (no more than a 1/2 teaspoon). Plate the salad and then place the salmon on top. Drizzle the sauce on top and that will act as your dressing too (you can of course always add more sauce). Enjoy! 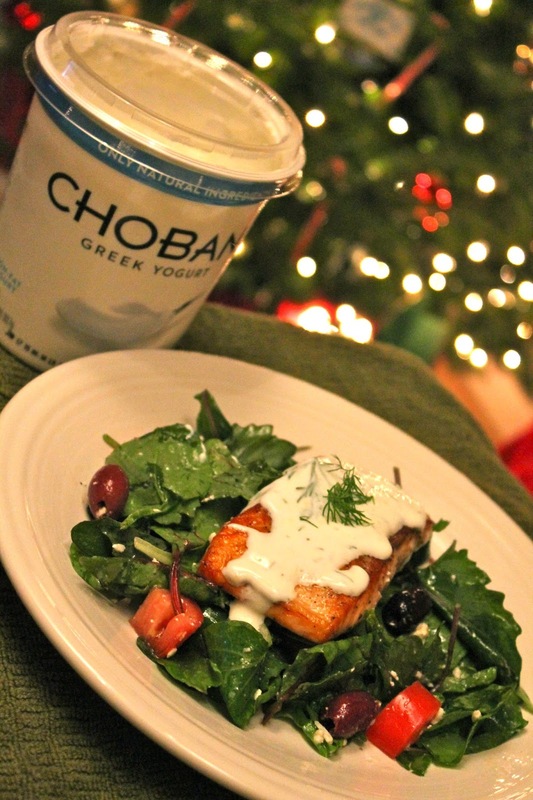 Now go ahead and join the #MadeWithChobani movement and find more recipes here.